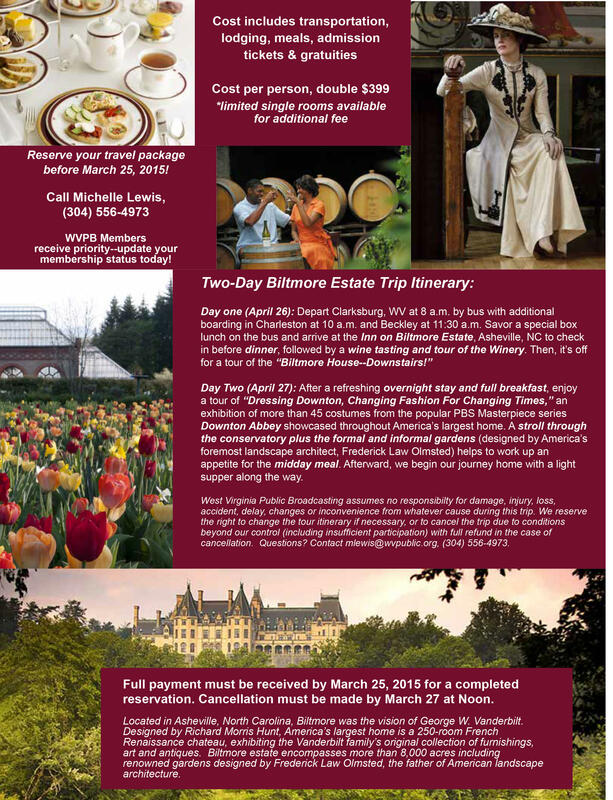 Travel with us to experience the elegance of Downton Abbey in America's own legacy of excellence, Biltmore. See a special exhibit of more than 45 costumes from PBS Masterpiece's hit series Downton Abbey, displayed through the lavish rooms of America's largest home. April 26 & 27. Bus Connections in Clarksburg, Charleston & Beckley. Overnight Stay at Inn on Biltmore Estate. Reserve now by calling Michelle Lewis (304) 556-4973 by March 25. Cost includes transportation, lodging, meals, admission tickets & gratuities. Cost per person, double $399. WVPB Members receive priority - update your membership status today. Get the printable pdf brochure here.